Health care and beauty are the most important things that occupy the minds of people, and in order to reach these people in a way that makes you the most appropriate to pay attention, you should pay attention to the marketing process and the presentation of your work and your abilities on them,Here comes the task of the website. Web sites and marketing are generally becoming more important now to reach your potential customers. Because people simply use smart phones and look at their screen most of the time to find what they want and therefore you should always be ready to show them your work on their screens in the most beautiful and strongest image. Since this has become a necessity, developers have set up a set of themes for this area, especially the field of dentistry. These themes are specially designed to fit with doctors, medical care centers and services in general, especially for dentists and all related to teeth in general. Therefore, in this report we provide you with a set of themes which will provide a lot of effort to explain your work and services of the various services and methods of booking and provide advice and market to display your products for your work through them. 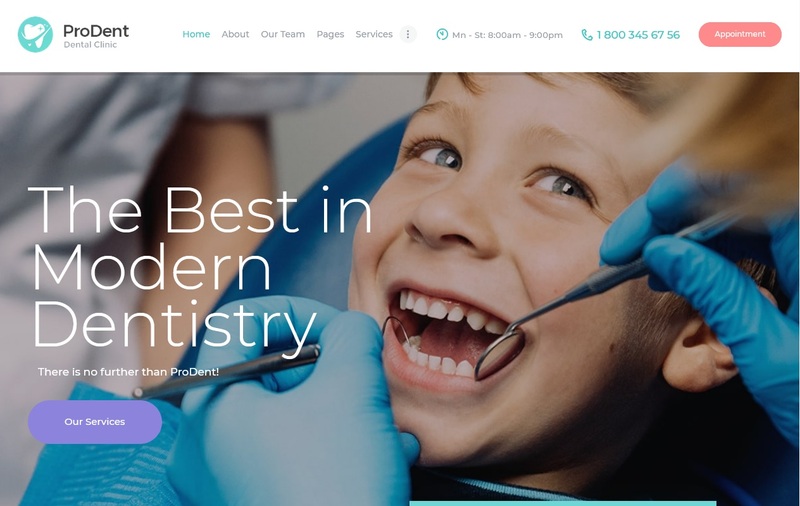 Dentistry is a job that is hard to market, but with Dent-All you can deploy, develop and manage your business in an easy and stylish way.the theme has everything You need for a successful WordPress website of your medical clinic, hospital or a personal dentist’s website. Dent-All is fully responsive and 100% Retina ready,comes with outstanding built-in plug-ins and custom modules: Revolution Slider, Appointment Booking, Visual Composer, Pricing module, custom services module.the theme is easy to Customize using Drag & Drop Visual Composer and Theme Options panel. The theme has more features like four color schemes, staff section, two different layouts for the services listing, 800+ Google fonts, and much more. It is designed for for dental practice & medical business. 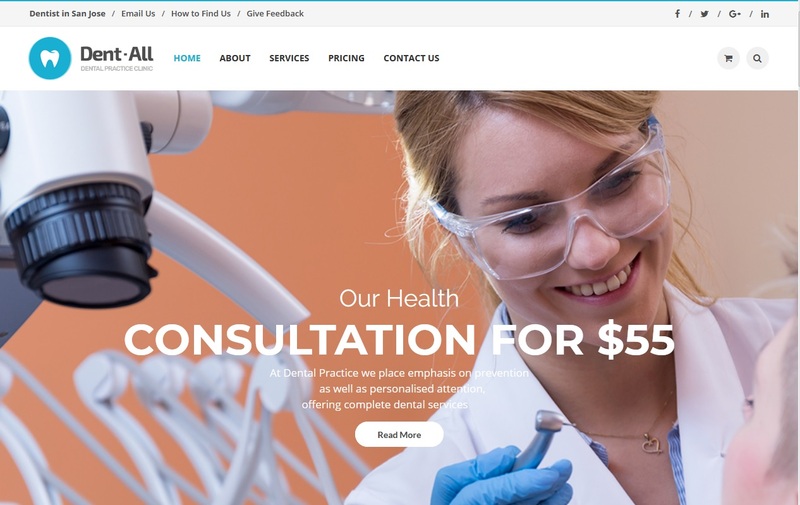 Dental Clinic, Medicine & Healthcare – modern, stylish & responsive WordPress theme is has over 750 different options and super-easy to customize. the theme is fully responsive, mobile friendly, WooCommerce and Retina-ready. It is perfectly fit for dental clinic, dentist or any other medical and healthcare related business. Also it fits hospital, research center or medicine pharmacy. The theme is Compatible with WPBakery Page Builder, Essential Grid, MailChimp for WP and Booked Appointments,and it give you a lot of ability with a lot of tools like Revolution Slider and Swiper Slider, flexible colors and various Google fonts,interactive Ajax search, icons, buttons and widgets, plus the set of super powerful custom widgets and shortcodes.and it is compatible with Chrome, Mozilla, IE10+ and Safar. the theme is multipurpose theme with seven unique multi page demos,and it is have powerful Page Builder plugin Visual Composer, and a plethora of theme options , translation compatible, standard WooCommerce plugin, MailChimp for WordPress plugin integration,one-click demo importer,and it is Ready for mobile devices. simple copy-paste in your Child Theme. You can choose from 6 predefined color schemes , smart sticky columns,over 20 page layouts, 200 icons, and 80 fonts to choose from so you can truly make this theme your own. the theme has a lot of features like over 20 page layouts and both boxed and full-width style , unlimited color options,and integrated with premium slider revolution and visual composer. the theme is right fit for clinic and hospital, medical institution, health care professional, doctor, dentist, beauty and wellness related web pages. 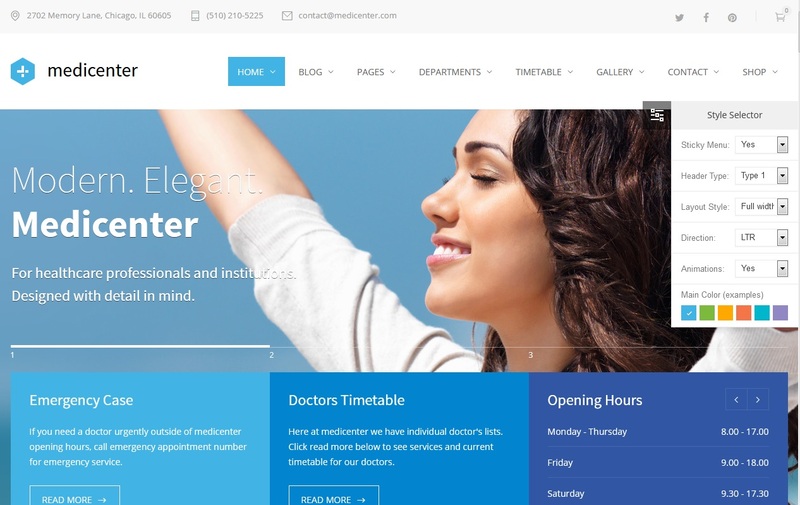 Prodent is ultimate, powerful & responsive Medical WordPress theme that primarily made for every pro dentist. 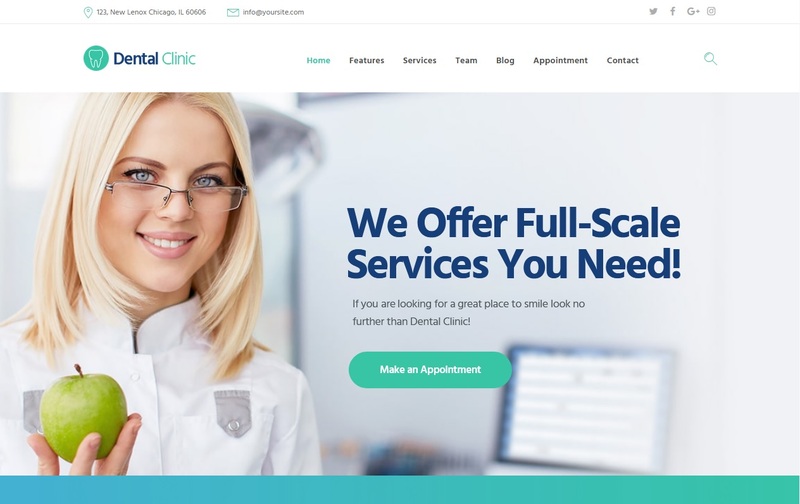 it has good features for Dentist as Online Appointments booking & management,Contact Forms, Full Woocommerce store compatibility, Dozens of premade pages: services, products, doctors, team, gallery & portfolio. The theme is compatible with WPBakery Page Builder, Revolution Slider, Swiper Slider and Essential Grid. It’s WooCommerce-ready and SEO optimized, and it can be edited with a simple drag & drop action ,and It supports multiple languages, Google Fonts and Maps, and offers super-easy updates. 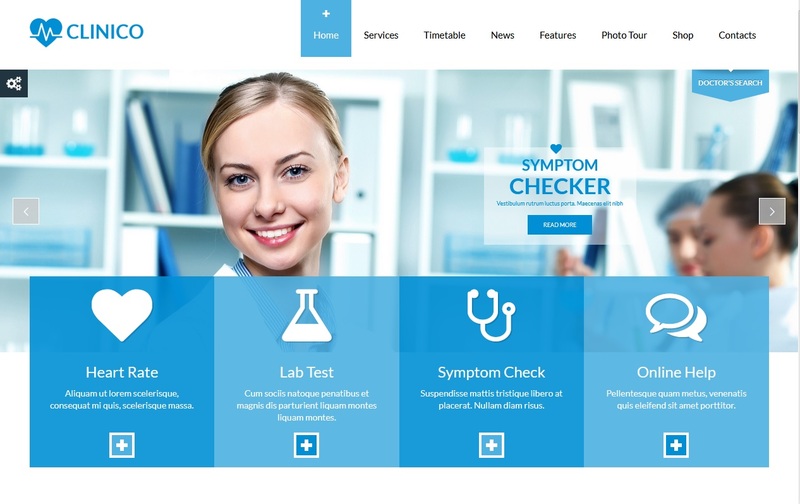 iMedica is the most comprehensive WordPress theme that has been designed for medical organizations. The theme has many great features like responsive code, ready grid graphics, a lightweight frame and a very flexible structure that makes it hang,9 demos included and over 20 premade homepages,simple drag & drop page builder. The theme also has responsive design with unlimited options,and includes over $100 of “goodies” such as Revolution slider, Photoshop plugin.it is SEO-friendly and Retina-ready,and Timetable Responsive Schedule. 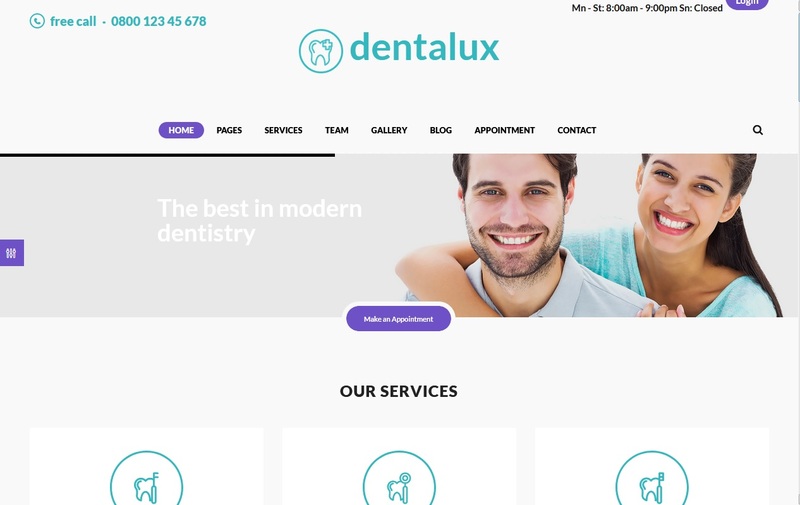 Dentaluxis is fresh & clean WordPress Theme designed for dental clinics, dentist & tooth treatment & repair business, and any other medical and healthcare related businesses, such as hospitals, research centers, dentists or pharmacies.It is is fully responsive and 100% Retina ready. The theme has built-in plugins such as Revolution Slider, Appointment Calendar, Essential Grid, PO Composer, Visual Composer ,Appointment Reservation, Basic Network, WPBakery Page Builder. This feature will greatly contribute to the success of your business, as your patients can now schedule appointments using their mobile devices as well! 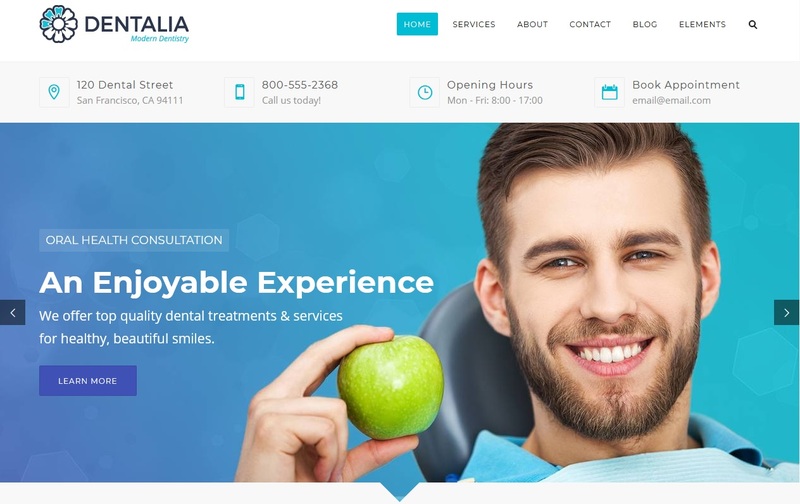 Dentalia is a highly customisable WordPress theme, perfectly suitable for dentists, healthcare professionals and companies. 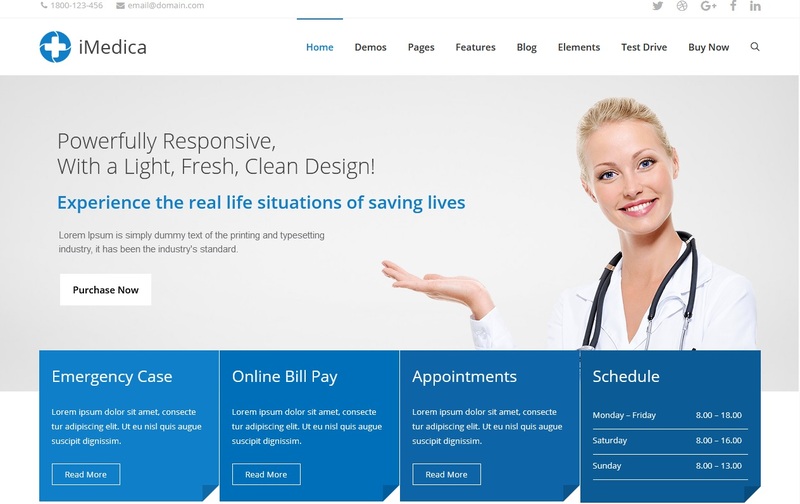 th theme has everything you need to build an outstanding website for your practice. It is fully responsive with a modern and clean design, unlimited color options and an easy to use page builder. Dentalia is also WooCommerce compatible and has unlimited color schemes,and so easy to customize. It comes with a visual page builder, It also includes Revolution Slider, Before and After Slider , tons of widgets to choose from, one-click demo import, multiple icon packs, two header types and a transparent header option, and much more. It’s mobile-friendly, translation ready and you definitely won’t regret using it. 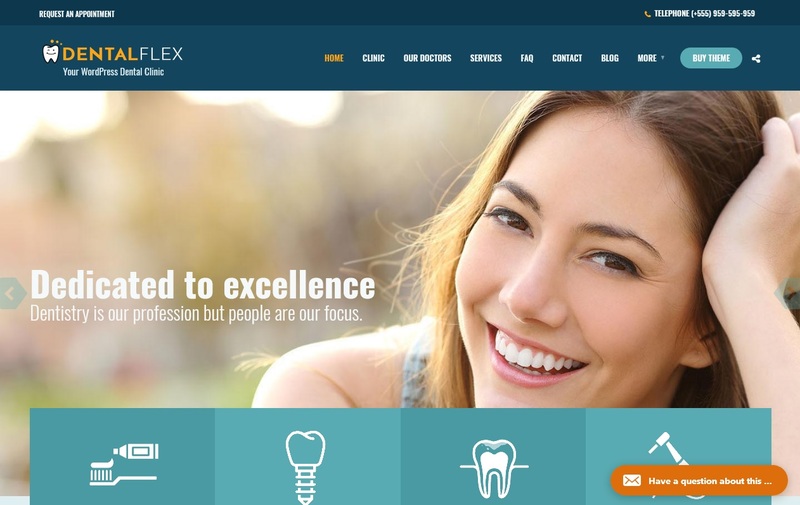 DentalPress is a premium WordPress theme that you are looking for. It made especially for individual dentists, dental clinics and other healthcare professionals and medical businesses. the theme has concept demos, multiple appointment systems, custom icons, vertical menus, and much more. With the optimized Visual Composer builder, it will allow you to drag and drop different elements. It’s fully responsive, compatible with WooCommerce and Retina ready, and have over 800 Google fonts and unlimited color options. with Dental Press You will have your site up and running in less than one minute with the one-click demo data installation,also with advanced flexible theme options and drag and drop page builder , You can build and customize your website easily with the intuitive. 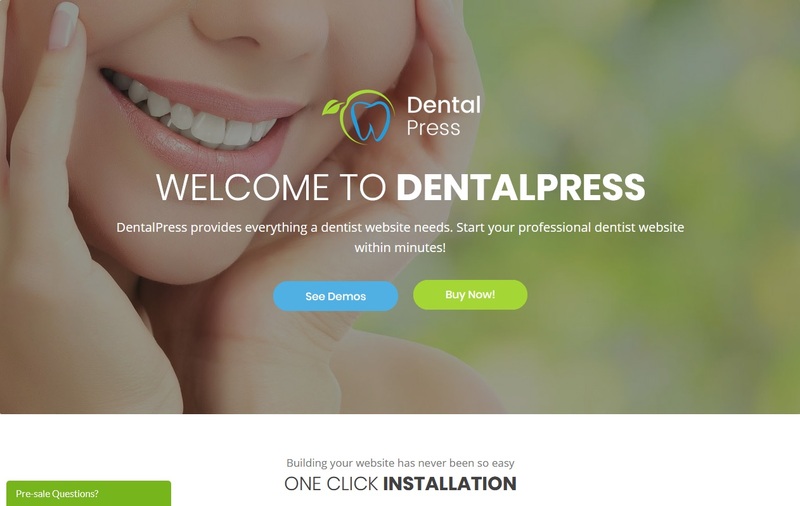 after a deep research of real similar websites,Dental Press comes to ensure that all necessary features and functions are covered. Clinico is clean, very powerful,practical and professional WordPress theme that what you need to show off your dental practice.its responsive design and retina graphics and versatile options make every customization easy and fun,and six predefined color schemes.The theme is also WooCommerce,Events Calendar pro and WPML ready.the theme is compatible with all browsers, it includes Revolution slider and Add widgets, use Google fonts, Sidebar Generator. You should always study your business well before you start your marketing campaign, then create your marketing campaign in a professional manner. You should investigate truthfulness. The website may help you bring in customers, but keeping them requires a lot of effort, work and honesty. Your website tells a lot about you and your business, so you have to pay attention to your business.